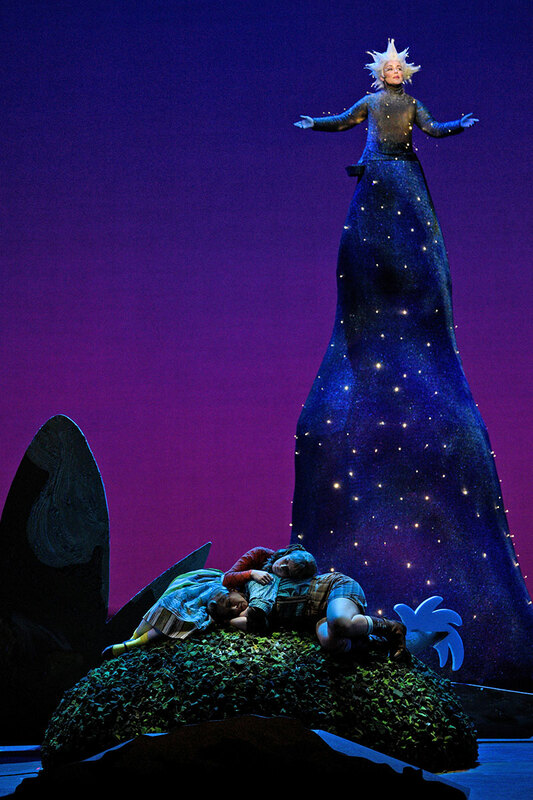 Hansel and Gretel at the Los Angeles Opera is the perfect holiday treat for the family. It’ll make you grateful for what you have. The pictures will stay with you in your dreams, as will the haunting, beautiful music. You’ll crave some gingerbread to boot! Do you remember your first trip to the opera as a child? Dressing up. Perhaps having a fancy meal downtown. Marveling at the chandelier in the vast foyer, and gaping at the jewels and evening gowns? Then sitting on your hands to keep from squirming (and getting pinched) through the endless singing, until intermission, where you hoped you’d be treated to a cookie? 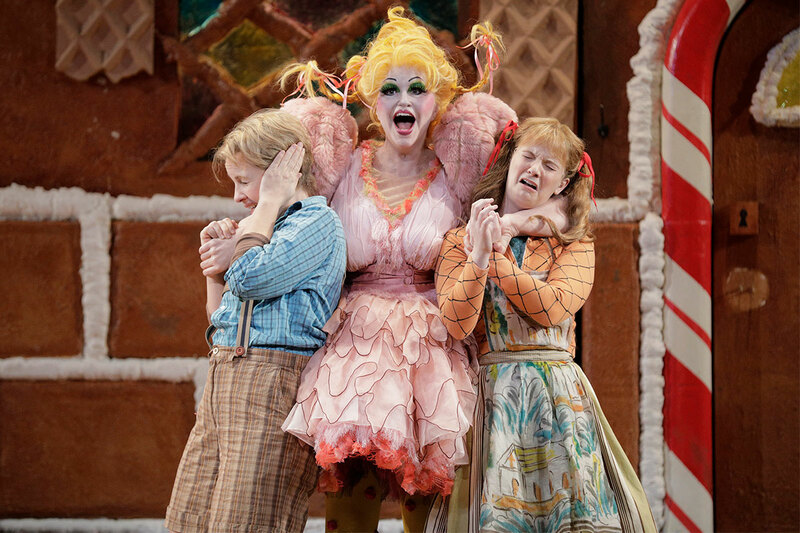 Sarah Vautour as the Dew Fairy with, at bottom, Liv Redpath (Gretel) and Sasha Cooke (Hansel) in Los Angeles Opera’s production of Hansel and Gretel. Photo (c) Karen Almond. Used with permission. Written by brother and sister team Adelheid Wette and Englebert Humperdink in the 1890s, Hansel and Gretel is a gentler version of the rather macabre fable by the Brothers Grimm. Humperdink’s opera, in the passionate hands of maestro James Conlon and director/designer Doug Fitch, is an infectious romp through scenes of shenanigans, sugar surfeits, fairies, magic, danger, pluck and victory. Hansel and Gretel has been a holiday family favorite for over a century. 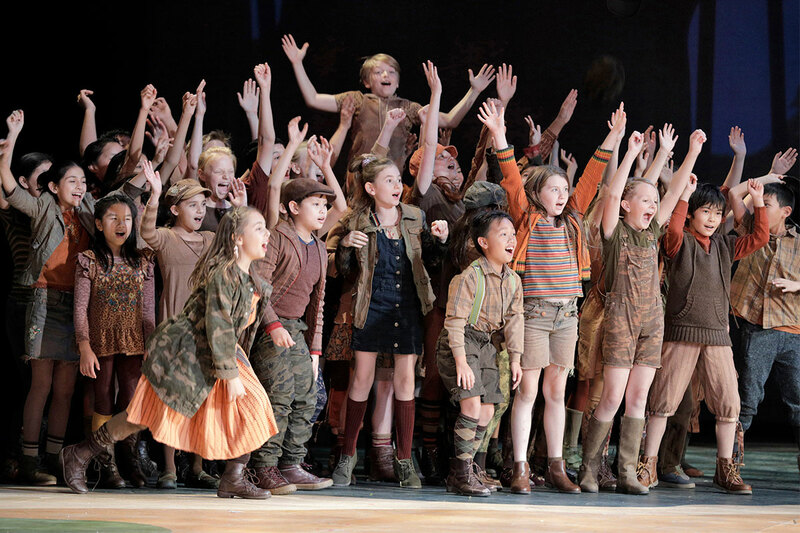 Members of the Los Angeles Children’s Chorus, in a scene from the Los Angeles Opera’s 2018 production of Hansel and Gretel. Photo (c) Cory Weaver. Used with permission. The Los Angeles Opera, under the general direction of the legendary Placido Domingo, is the premiere opera house of the world. The talent he brings in and the singing he inspires is always spectacular. But what really sets LA Opera apart is the artistic ambience, created through the set design, costumes, lighting and special effects, and the playful fervor with which the singers immerse themselves into their roles. Susan Graham (center) as the Witch, with Sasha Cooke (Hansel) and Liv Redpath (Gretel) in Los Angeles Opera’s 2018 production of Hansel and Gretel. Photo (c) Cory Weaver. Used with permission. 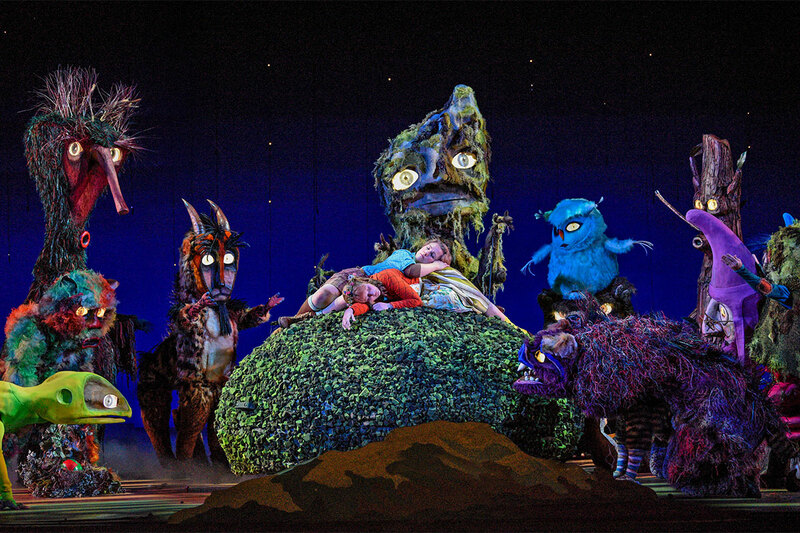 Fanciful forest creatures serve as the guardian angels protecting Hansel and Gretel as they sleep in the forest. 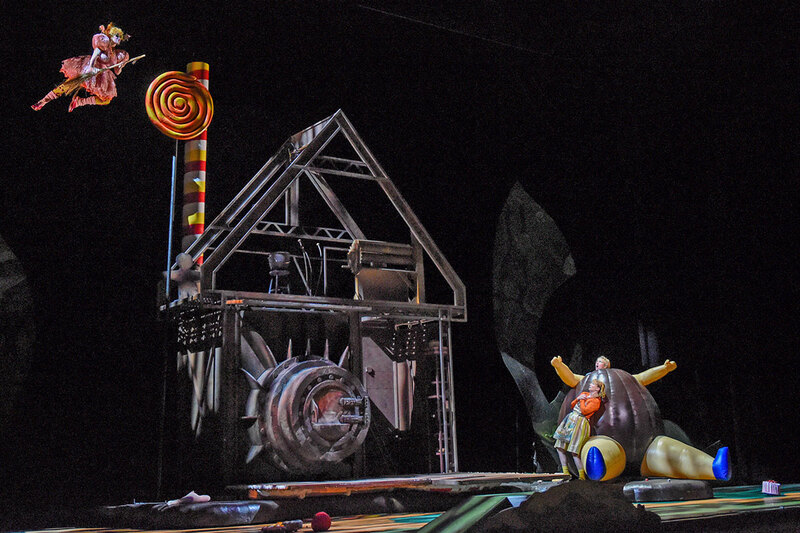 A scene from Los Angeles Opera’s 2018 production of Hansel and Gretel. Photo (c) Karen Almond. Used with permission. Susan Graham (as the witch) explodes upon the stage in Act 3 in all her wacky splendor, sparking the entire cast to greater heights. Graham is a superstar diva extraordinaire who clearly relishes this role. She prances about the stage, as she fattens up Hansel for her feast. Then she whisks through the air on her broom, inspiring the audience to erupt in applause. Hansel and Gretel is the perfect holiday treat for the family. It’ll make you grateful for what you have. The pictures will stay with you in your dreams, as will the haunting, beautiful music. You’ll crave some gingerbread to boot! 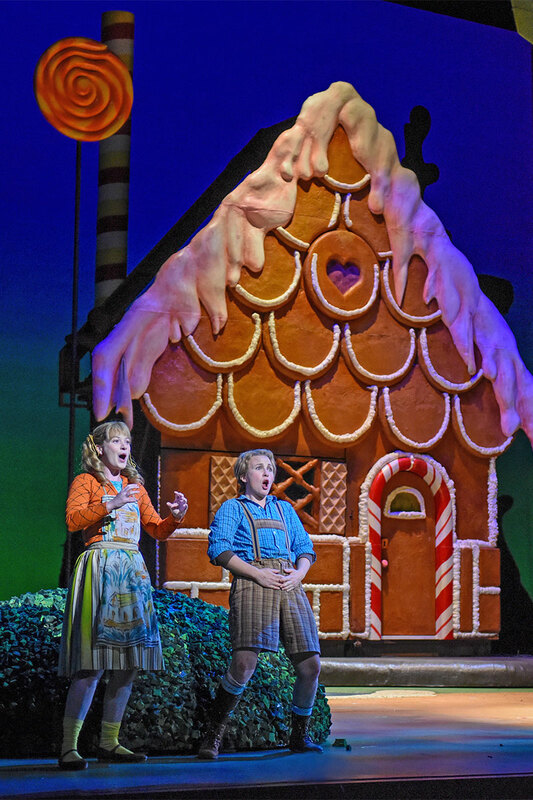 Hansel and Gretel is playing now through December 15, 2018 at the Los Angeles Opera.